In a cooker or a steamer take 1 cup water and put the stand in it. In a bowl put besan, salt, sugar, ENO, citric acid and water and mix well so that no lumps are formed. Simultaneously put the cooker on gas and when the water starts boiling , simmer the gas. Transfer the batter to a greased aluminum bowl and place in the cooker on the stand. Now close the lid , WITHOUT THE WEIGHT, cook on high flame for 3 minutes, then on low flame for 15-20 minutes. Check with a knife, if the batter doesn’t stick on the knife it is ready. Take it out from the pan and cut into pieces. In a kadahi, take 1 tbsp oil, put rai seeds when they start cracking add 2-3 green chilli, let them turn golden brown. Switch off the gas and put the dhokla pieces and mix nicely. Put a few drops of lemon juice over it and serve. 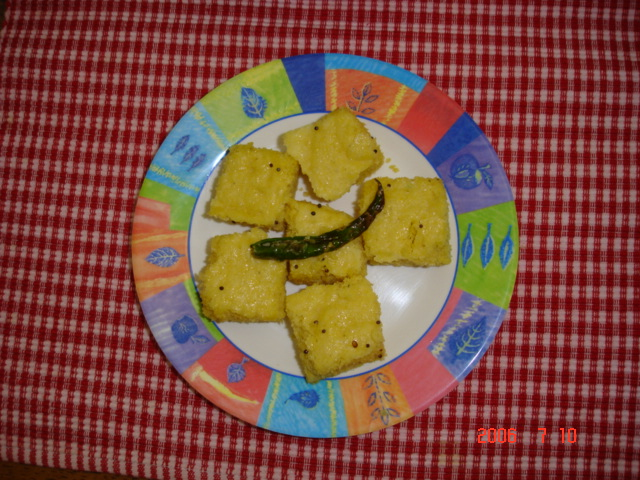 hi, i make instant dhokla in the microwave with suji. one cup of suji with one tbsp of besan and all the other proportions as are given. add one tbsp of cooking oil and keep in the microwave for 10-15 minutes. remove , cool and then do wagar or tadka with ghee or oil and mustard seeds,jeera and til seeds, add green dhania, try it out for a quick snack.very fast and tasty. can also add curry leaves in tdka. Hi Anand, this recepie is quite simple. Pls feel free to ask any doubts ! !